(CNN)—In spite of tepid reviews from some film critics, "Les Miserables" is booming at the box office, and that financial success can in part be traced to a group of its biggest boosters: Christians, particularly evangelicals whom NBC Universal went after with a microtargeted marketing strategy. NBC Universal looked to capitalize on those components and promoted the film to pastors, Christian radio hosts and influence-makers in the Christian community. The latest film adaptation of the musical is raking in the cash. As of Wednesday, NBC Universal reported, it had pulled in $80.57 million in 2,814 theaters. After winning Christmas Day, the film finished third in the box office totals over the weekend, according to BoxOfficeMojo.com, narrowly losing out to "The Hobbit" and "Django Unchained" despite being on significantly fewer screens. “If you’re a Christian and you’re seeing this film, you can’t help but see these themes,” said Jonathan Bock, founder and president of Grace Hill Media, the firm hired for the targeted marketing campaign. Screenings set up across the country in advance of the film’s release filled up fast, he said. Bock’s firm has worked on marketing campaigns in the faith community for hundreds of television and film releases, and normally, the screening invite-to-attendee ratio is 4-to-1. “This movie, we booked at 1.4-to-1, and we had turn-aways in every single market. Almost everyone who signed up showed up for the movie,” he said. “There’s a great deal of awareness about the movie itself, and the great thing is that the movie itself delivers,” added Bock, ever the marketer. Colorado Springs-based Focus on the Family was one of the groups that partnered with Grace Hill Media for a special screening. For the event, Focus on the Family brought in partners from across Colorado, adoption agencies, child welfare officials and church leaders. “We’re trying to raise awareness for the needs of kids, particularly in the foster care system who don’t have any families. We love to come alongside them and welcome them home, and for that reason, we loved the movie,” said Kelly Rosati, vice president of community outreach for Focus on the Family. She oversees their adoption and orphan care initiative. “I think that’s something the movie did in a beautiful way: It stirred the heart without ever having to directly issue a call to action,” she added. Another coup for marketers was getting young evangelical leaders like the leaders of Catalyst, the hip conference for young evangelicals, out to see the film. Brad Lomenick, executive director of Catalyst, called it “Epic film. Powerful" on Twitter and suggested that Hugh Jackman’s performance was Oscar-worthy. “Christian film critics who view themselves primarily as film critics generally pointed out the same flaws in the movie that everybody else did, which is (director Tom) Hooper’s insistence on closeups and going for the easy emotional cues instead of visual storytelling,” said Greg Wright, managing editor of HollywoodJesus.com. That seeming inattention to the artistry of the cinematic endeavor is probably lost on most Christians who have seen the film, Wright said. “I always felt, looking at the success of the musical, you couldn’t explain it any other way than it was resonating with people on a spiritual level, not just on a musical level,” Wright said. It carried over in the film too, he said. His site had four reviewers take a stab the film. “The response was overwhelmingly positive,” Wright said. “The point for us is not what the art is but what the art does from a spiritual point of view. “We don’t care as much if this is the best movie ever, but are people responding to it, and if so, why?” Wright said. Like others, marketers heavily targeted HollywoodJesus.com. “We’re probably the strongest skeptics as anybody when it comes to this stuff because we see so much of it. When you smell a rat, it’s pretty clear that it’s a rat, and 'Les Mis' was not that,” Wright said. The microtargeting campaign aimed at the faith community included the bully pulpit model and traditional advertising in Christian periodicals, on radio stations and on websites. For a film of this size, Bock said, it isn’t uncommon for studios to spend anywhere from $30 million to $130 million on a worldwide marketing campaign. Though he was unwilling to get into specifics on what his company earned for this job, he said that for a job like this one, it would not be uncommon for a studio to spend upward of seven figures for a marketing campaign targeting the faith community, including ad buys in traditional and digital media. At the end of the day, most marketers won’t say what specifically got viewers to get off their couches and buy tickets to the movie. Christians see the same ads in mainstream newspapers and same trailers at movie theaters as everyone else. Bock says it’s more of an art and less of a science. Bock is himself an elder at his Presbyterian church in Los Angeles. While that gives him an edge in marketing to the faith community for certain, he said, the best tool any marketer can have is a great product. “You can put a turd in a Tiffany box, but in the case of this film, there was a Tiffany ring in the Tiffany box,” he said with a chuckle. CNN's David Daniel contributed to this report. I cannot bring enough of the work out routines. It's pretty cool. Desire they had much better guides although. Ok well here is my take to those who are christian hates. I was a skeptic, because I don't usually like film adaptations of musicals. I thought exactly the OPPOSITE of some of these critics... while other film adaptations (i.e. RENT) are heavy on song and dance numbers, watching Les Mis I almost forgot at times they were singing. Often, in such adaptations, the story is hard to follow because the dancing, etc., distracts from the content. I thought it was exactly the opposite in Les Mis... the singing was great, but the makers used the "miracle" of film to really bring the story to life. It would have been an incredible movie, even without the song and dance... but they worked that into it beautifully. In terms of "Christian" themes - I am a Christian, but lets face it... these themes are not uniquely Christian. Themes of redemption, forgiveness, freedom, liberty, and how living according to the "letter of the law" without understanding the heart of the law - while themes that Christianity certainly emphasizes - are themes that resonate with humanity in general. It speaks to the heart of the human condition, regardless of your spiritual or religious views. Please, let's us not forget that Les Miserables is a novel by VICTOR HUGO. It's a 1300 page book with a profoundly religious theme – depicting a man's redemption. I think the movie did a great job at portraying Hugo's message, as all the important events and features were captured effectively. Too often I see film adaptations that play down religious themes in order to reach larger audiences, and in doing so distort and harm the essence of the story. A good example is Narnia. Granted, it is a children's book. However, they expelled much of the story's religious character (besides the concept of good vs. evil) and made it into a corny hollywood film loaded with Lulu Lemon-type cliches. It seems as if a number of critics are uncomfortable with the spiritual elements in "Les Miserables," whether on stage or screen, but do not want to criticize it on that level (hence inviting the perception of religioius bigotry) and so deflect to other matters of a stylistic nature. As for close-ups, film is a close-up medium. Show me a musical that is adapted to film that does not use close-ups. You see this is classic adaptations like "Oklahoma," South Pacific," etc. too. One can argue that the close-ups actually bring the story to a clarity for the average viewer in a way that the stage production does not. I've heard people who have seen both say that they could follow the storyline much better in the film that with the stage production. Why would anyone expect a Hollywood critic to praise a movie with a religious theme. Look at what they do praise – all the things that are taking our country down. Read Nahum 2 & 3. We are headed in the direction of Assyria & Nieveh!! As a person reading the book, and actually listening to the soundtrack as of right now, Les Miserables has several themes to it not just including Christianity. Victor Hugo was a politician before he was kicked out because he didn't want Napoleon III to be the head of the government. He put as much politics into his book as much as he did Christianity. People also don't realize that musical lovers would go as much as Christians would. 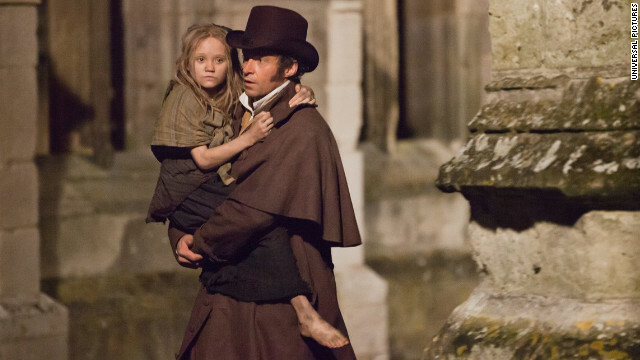 I am a Christian, and that is not the only reason why I love Les Miserables. I love it because I love musicals, I love the book, I love the message it gives, and yes I love it because it's Christian based. If you can't love it because it's Christian oriented, then love it because of the wonderful music and choreography, and the great story and meaning behind it. I know several people who have seen and enjoyed this film, and none of us are Christians.